I had always wanted to build a custom motorcycle. This was my first attempt: a "naked" Ducati Multistrada, a.k.a. a Multimonster or a Monsterstrada. Done on as much of a budget as possible, and in short of a time as possible, it cost me thousands of dollars, took months and was incomplete at the end when I sold it. But I regret nothing. The final product, my naked Ducati Multistrada. I miss it, but I'm also glad it's gone. Note: These are my notes and photos in summarised format. I tried to document as much as I could, but I didn't write everything down (also, some of it is boring). If you have questions, hit the "Facebook" link and send me a message. If you're looking at this and don't have a Multistrada already, you should probably buy a Ducati Monster... here's my guide on which Monster to buy. In 2016, I bought my first motorcycle built for long distances: the Ducati Multistrada 1000DS. It was a 2003 model with 18,000 miles on the clock. I bought it because I wanted to go on a 1,000 mile journey from San Francisco to Arizona, a trip I never made on motorcycle. I had three candidates on my shopping list: a Ducati Multistrada 1000DS, a BMW R1200GS or a Triumph Sprint ST 1050. This one was available for $3,995 from a local mechanic, and so after a couple of afternoons of thought, it was mine. The problem was: I never really fell in love with the Multistrada. I grew to like it, but not to love it. So after a few short trips, I decided to change it. General disclaimer: This is no work of art. I'm proud of it, even though I didn't get to the finish line, but it's only because it was far harder than I thought and I persevered through several phases of regret. If you want to do this conversion you'll have to at least do these things, but probably more cleanly, and definitely more, too. This is a brief summary of everything I learned while doing this project. Read the whole article if you want the gory details. Never, ever strip a motorcycle that has intact fairings. You're stripping off thousands of dollars of value. It's unlikely they'll go back on in a jiffy if you decide to sell it. Only do this with motorcycles with busted fairings, preferably something with a salvage title that you bought for a song. Every project is about 5x as hard as you think if you've never done anything like it. 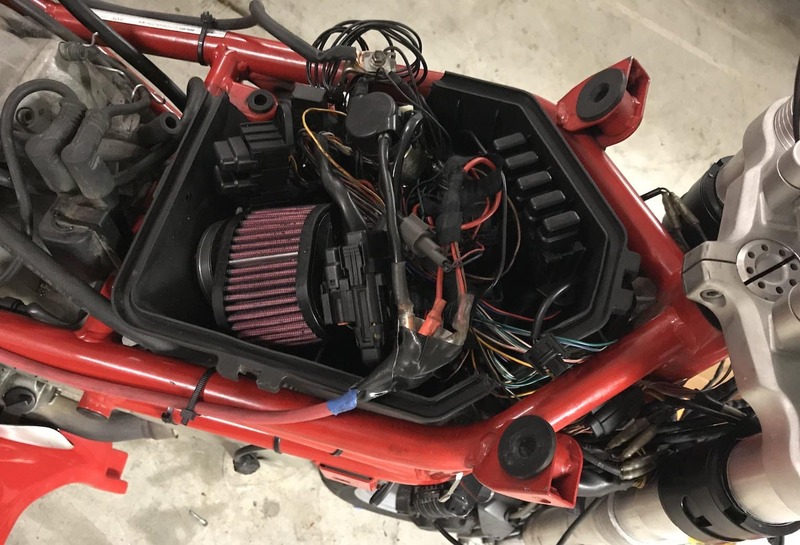 Unexpected things crop up, like it being unexpectedly hard to remove the tank, fit a replacement headlight, clean up wires or replace a catalytic converter. Be prepared to do custom fabrication of light components. Like, you might have to make custom mounts for things like oil coolers, the battery, the dash display and more. If you don't have metal, clamps, drills and whatever else to do light sheet metal fabrication, you shouldn't get started. You may never trust something you've worked on the same way. I knew how many wires were exposed, what was likely to be stressed and I didn't have the wherewith-all (or the patience) to resolve everything. I got nervous about riding in the rain. Nobody should feel that way! But it's not all bad news. Here are the positive things I learned. You're a "builder" after your first build. Once you've built your first motorcycle and people know it, you're a "builder". You are more entitled to have opinions. They'll be informed ones! Confidence comes from small first steps. I embarked on my second project, restoring a written-off Triumph Scrambler (coming soon here!) and selling it for a profit. Working on motorcycles is a great way to spend a rainy day. You can't ride. Time to get intimate. My main, necessary costs were the parts. The following is what I paid for them shipped. This all cost me $585, or $385 without the workshop time. This is the Multistrada, still not totally complete but looking good. The final naked Monster-like product obviously felt quite different to the original Ducati Multistrada. Firstly, it felt lighter. It may not have actually been a lot lighter. But the fact that it didn't have all that bulk at the front made me feel more in control. Secondly, it felt more like a "supermoto/supermotard/hypermotard" motorcycle. Something like a Hyperstrada in configuraton — tall, wide handlebars, with a similar displacement v-twin It's not one - it's too heavy, and the wheels are too big (they're 17 inch). I always knew how high up I was. But now, perched up there with wide handlebars, I felt like I was on a very different motorcycle than before. A few other mods I had made along the way, like the straight-through exhaust headers and the naked clutch cover (which I later, ironically, replaced with a billet aluminium sound-deadening clutch cover) made it sound very different, too. The exhaust never sounded great. Even with Remus pipes and the custom headers, it sounded like... a lawnmower. Disappointing. But it still looked the business! Here's the Multistrada 1000DS in its original, faired glory. In short, the Ducati Multistrada 1000DS was a motorcycle that divided people into two camps: those who liked it despite its looks, and those who "actually" liked it for its looks as well. The Ducati Multistrada 1000DS is an upright sports-touring motorcycle. It runs an air-cooled 992cc air-cooled v-twin motor pumping out 68kW (92hp) of power and 87 Nm (65 ft-lbs) of torque. It's fast. You want to ride it at around 120-140km/h. You can ride it up to around 160km/h before acceleration starts slowing; I've had it around 200km/h, but didn't really enjoy it at that speed on public roads. It has the nice bits many Ducatis have: a single-sided swingarm, a dry clutch, a burbling under-seat exhaust, Öhlins upside-down fully adjustable forks, a fully-adjustable Öhlins monoshock and strong brakes gripping huge 320mm front discs. It weighs a fairly light 188kg dry (probably 210kg wet), has huge ground clearance and has big wide handlebars, making handling a pleasure for a bike aimed at long distances. The Ducati Multistrada 1000DS is NOT an off-road motorcycle. The front rake is pretty narrow, the 17 inch tires are usually unsuitable and the engine is unguarded. The ground clearance may be decent, but the travel isn't what you'd get on a CRF250L for instance. Why strip the Ducati Multistrada naked (and not just buy a Ducati Monster)? There are a number of other ways of phrasing this question. Well... the Multistrada 1000DS is arguably the ugliest motorcycle Ducati ever made. This isn't saying much, considering it shares a stable with incredibly beautiful beasts like the one below. 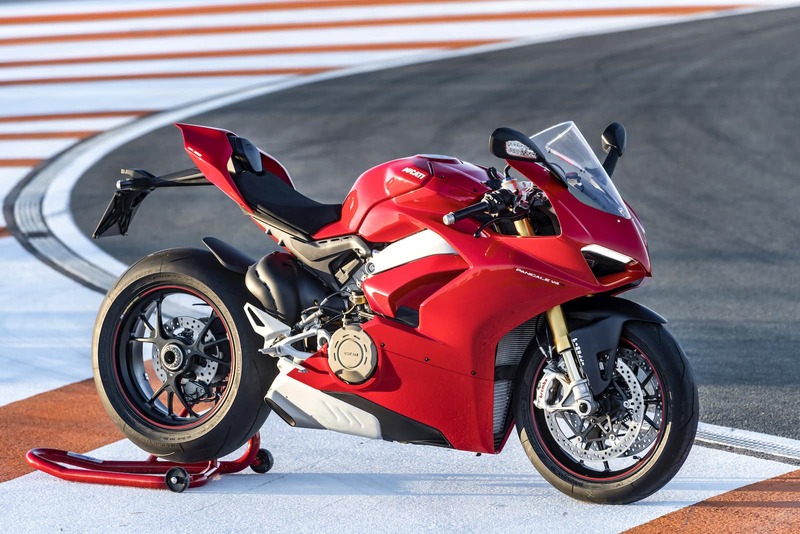 The Ducati Panigale V4, one of the best looking motorcycles in the world right now. Oh boo-hoo, the Multistrada is uglier than this? What ISN'T uglier than a Panigale? This isn't just my opinion. Others think the Multistrada is ugly too. Like the last, many were quick to qualify their opinion. So, not all bad. What's to like about them? A lot. The suspension is fantastic. If you weren't totally sold by "Öhlins", then you'd be won over by totally adjustable front AND rear suspension. The engine is known as "bulletproof". I know, this is super anecdotal. It basically means they don't have the reputation for being total lemons. That said, they're still an air-cooled Ducati, which means 6,000 mile or 10,000 km valve inspections and/or belt changes are par for the course. They have that single-sided swingarm and under-seat exhaust combo. 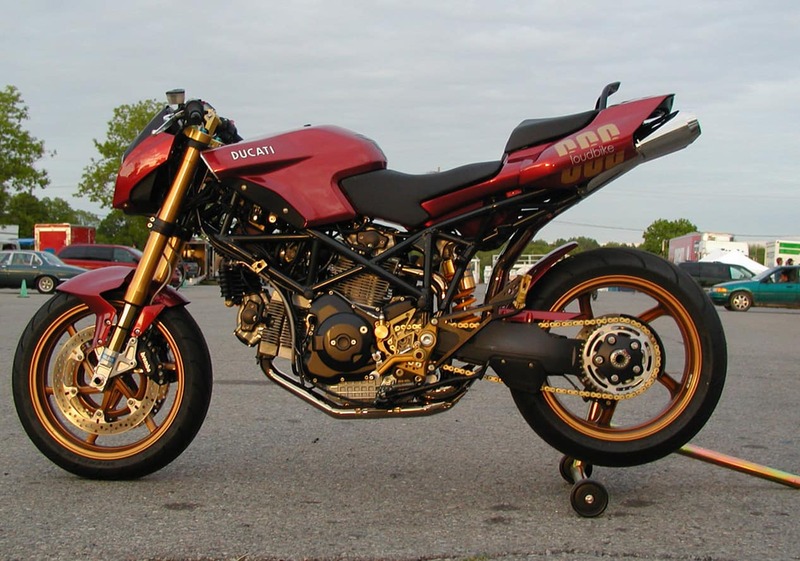 The under-seat exhaust was never found on Ducati Monsters, and single-sided swingarms only existed on higher end models. That, and the Multistrada is just affordable. Being an ugly duckling, they go cheaply for bikes in good condition with low miles. So it was very tempting to pick one up. When I googled it "Naked Multistrada 1000DS", I started finding pictures around the internet like the one below. Once I had found a few, it was time to get started. 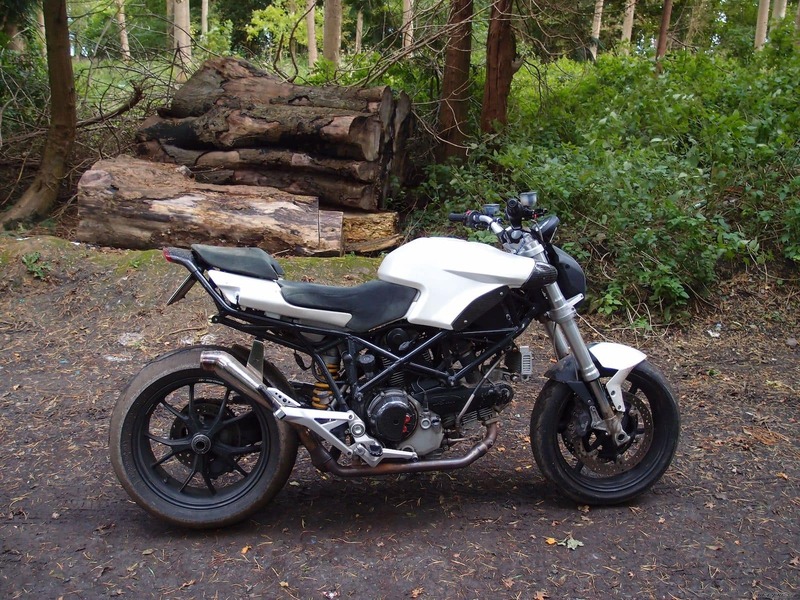 Inspiration for my Naked Multistrada, another much tidier job done on a 2005 model. Second inspiration, by a forum member named "loudbike". Though I knew I'd never get this far. Here are all the things I had to do in summary form. More detail below. Relocate the battery and computer from the outside of the frame into the airbox. Get pod filters and cut big holes into the airbox, in order to fit the battery and computer into it. Get a new mount for the oil cooler, the easiest way being to get a valve cover from a Monster 1000. Get a more appropriate (and almost definitely custom) fuel tank. This was important aesthetically. The tank looks like it needs to have other things fit to it. It would be quite expensive to find a suitable replacement (this one has an internal fuel pump) short of a custom job so I didn't. Make a better mount for the front instrument dash. This would have been easy but I didn't have the tools or space. This wasn't so hard, you can do it yourself. You remove every screw until you don't have any left. As you can see in the photo, the battery is now exposed. Attached near there is a fuse box and the fuel injection. On the front, you can see the oil cooler attached to the same mount holding on the front light fitting and fairing. I tried to put the battery under the seat. I even extended the battery cable with heavy duty cable I bought from eBay. However, it didn't fit properly under there for reasons I can't remember. So I put it in the battery box, along with the fuse box and the computer. 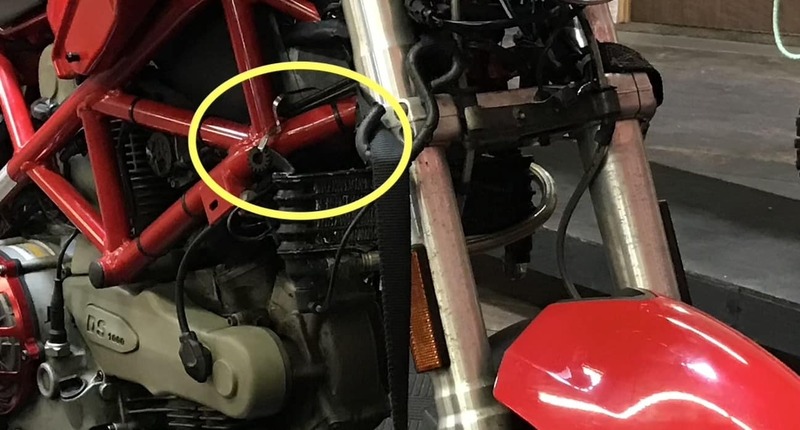 One thing I learned from a LOT of googling: you have to earth the computer with a wire, otherwise the motorcycle won't start. It's earthed to the chassis when it's mounted there. As you can see, I also mounted pod K&N filters, just to make room for the electronics and battery. 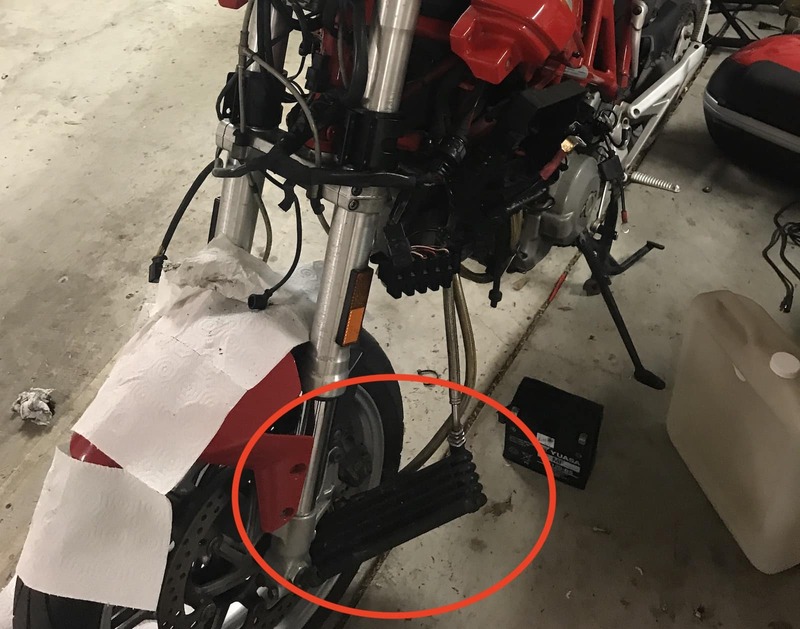 Once you remove the front fairing, you also need a new headlamp and to wire it to the giant connector you've unplugged. These headlamps come with built-in turn signals, and clamp directly to the upside-down forks. The correct size is 53mm. I nearly bought the wrong size. Brian from SpeedMotoCo saved the day and corrected my order, so I'm happy to make a referral to him — he saved us both time and money. Plus, the whole assembly was only $160, which is a bargain compared to most aftermarket parts. The original oil cooler sits on the front forks, bolted there by a bracket also attached to the front headlight assembly (if I recall correctly). Make a custom mount for it. Great idea, if you know how! 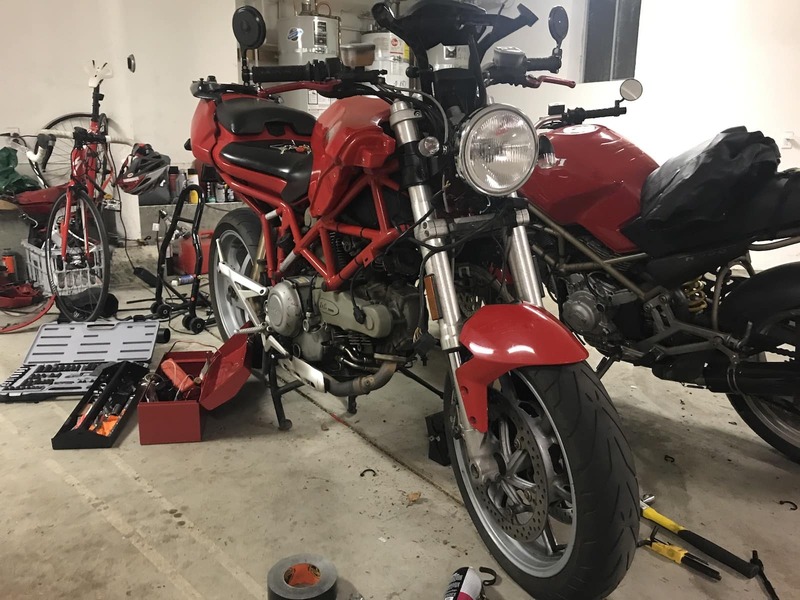 I contacted a local Ducati wrecker near San Francisco who sent me an oil cooler plus the mount (onto the front valve cover) from a very similar engine, the Monster 1000DS. It fit nearly perfectly. I had to re-use my current oil cooler as it was a different size, and it fit onto that mount with a few washers. I always thought the Multi sounded a bit like a lawnmower compared to most Ducatis I had heard, including my Monster 900, Supersports or even Ducati Monster 696s. Granted, those had Termignoni exhausts, but that's what I thought the problem was. Like many Multistradas, mine came fitted with Remus pipes. You can replace the downpipes and eliminate the catalytic converter. I found some Arrow pipes online for $300. Unfortunately these are no longer produced, so you'll have to get some from a wrecker only. If you've read this far, congratulations! Obviously there are a lot of open questions. Hit me up on my Facebook page if you have any.